JUMAS project addressed to the need to build an infrastructure able to optimise the information workflow in order to facilitate later analysis. New models and techniques for representing and automatically extracting the embedded semantics derived from multiple data sources will be developed. The most important goal of the JUMAS system is to collect, enrich and share multimedia documents annotated with embedded semantic minimising manual transcription activity. JUMAS is tailored at managing situations in which multiple cameras and audio sources are used to record assemblies in which people debates and event sequences need to be semantically reconstructed for future consultations. The prototype of JUMAS will be tested interworking with legacy systems, but the system can be viewed as able to support business processes and problem-solving in a variety of domains. Public Administrations represent the largest information bound professional communities: among them the judicial sector is one of the largest, where the needs of cooperation are critical creating an exceedingly large improvement potential through adoption of novel content management techniques and development of new solutions for its specific needs of retrieval and semantic analysis. This potential is even larger considering the growing transnational cooperation also among several national law systems, highlight the need to adapt the technological profiles of new member States. In this context, JUMAS is the leverage able to converge to an actionable knowledge starting from the content revolution. In particular, JUMAS envisages a system for the embedded semantic extraction from multimedia data that join into an advanced knowledge management system. Moreover JUMAS is tailored at managing those situations in which multiple cameras and audio-sources are used to record assemblies in which people debate and event sequences need to semantically reconstruct for future consultation. Knowledge Models and Spaces: Search directly in the audio and video sources without a verbatim transcription of the proceedings. 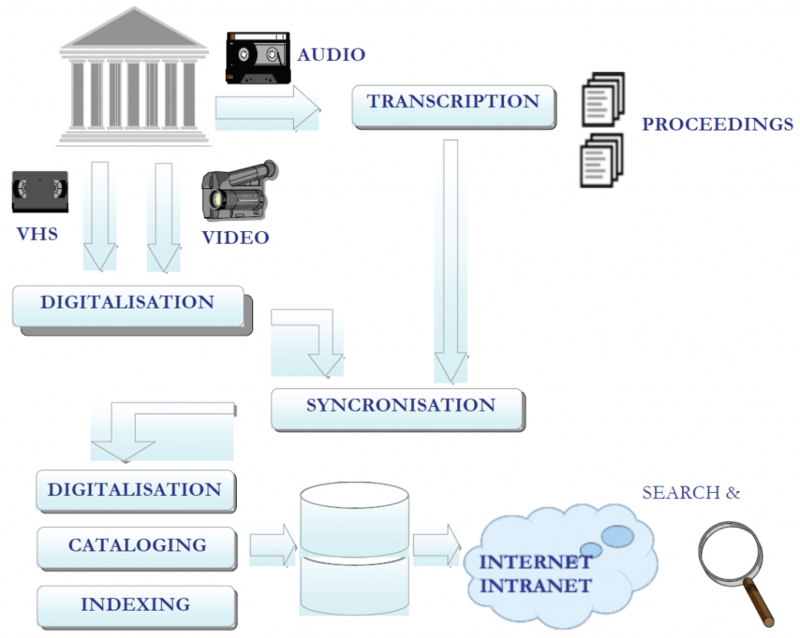 Knowledge and Content Management: Exploit hidden semantics in audiovisual digital libraries in order to facilitate search and retrieval, intelligent processing and effective presentation of multimedia information. Sensor and Multimedia Integration: Information fusion deriving from multimodal sources in order to improve accuracy in automatic transcription and annotation phases. Effective Information Management: Streamline and optimize the document workflow allowing the analysis of (un)structured information for document search and evidence base assessment. ICT Infrastructure: Service Oriented Architecture supporting a large scale audio/video retrieval system focusing on scalability, interoperability and modularity.